Can You Give Yourself Some Compassion? Most of us think about compassion as an emotion that we feel for others. We feel concern for them and hope that they will not have to suffer either physically or emotionally. We do not think about directing compassion towards ourselves as we fear we may be complaining, feeling sorry for ourselves or wallowing in what is painful for us. Studies have shown that self-compassion reduces stress and increases self-worth and resilience. Read my article on this site, The Ability to Rebound and Heal, to learn more about resiliency. What areas of your life do you usually judge or criticize yourself? Do you focus on how you look, your relationships, your job, or what you can no longer do because cancer has changed your life? What is your self-talk when you notice some flaw or mistake? How punishing are your words, and what is the tone of your thoughts about yourself? Remember, you are all talking to yourself all the time. How do you feel inside when you are being judgmental or critical? When you are critical of yourself, do you feel cut off from others or recognize that all of us are imperfect? What feelings come up when you are so hard of yourself? Do you feel more satisfied and motivated to change or angry, depressed or discouraged? When you imagine being more accepting of yourself, how do you feel? Is this thought encouraging or does it scare you because you fear you won’t be motivated to change or will fall into a well of self- pity? How have you reacted to cancer? Have you tended to deny the challenge to others (or yourself)? How much self-care and comfort have you directed towards yourself? Has the illness cut you off from others to such an extent that you feel isolated and either angry or depressed? Our society is very critical of any behavior that is less than perfect. We are told that unless we are tough on ourselves, we will not succeed or even worse that we are lazy. We are often told that no matter how hard we try, often our best just isn’t good enough. We then take in these messages and feel unworthy –it’s very hard to give ourselves compassion and love. When you have been faced with the losses that come with cancer, you often can’t do some of the things that you did before the diagnosis. The result is feeling not good enough and then self- critical. 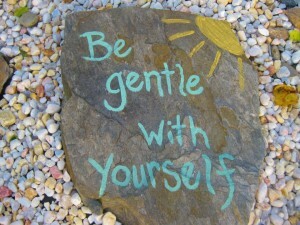 What are some ways that you can build more self- compassion towards yourself? Be mindful of the painful emotions that this self -judgment creates inside you. Consider writing about the emotions and how you feel after a difficult situation. Write about you fear, anger, shame and try to be more accepting and non-judgmental. Have a balanced approach- not putting yourself down so completely, but also looking at the situation with some level of responsibility for your behavior. Recognize that you are just human. This means accepting your lack of perfection ,and that there is pain and suffering in this life. Remember, you do not have to be perfect to be worthy of love- either from others or yourself. Practice some self kindness either through words or actions to yourself or others. Take that extra moment and show some patience or generosity to others. Consider the healing power of writing your thoughts and feelings to increase your kindness to yourself and others. Some of us believe that the only way to motivate ourselves is to use self criticism to change those personal qualities that we don’t like. How does it feel to be judged in this way? Can you think of a kinder more caring way to motivate yourself? Remember that a wise nurturing friend, teacher, or parent would use language to show you what may be wrong, but with a more encouraging tone. Try to challenge that critical self talk. Self compassion is directing acceptance towards yourself- It’s like putting money in the emotional bank so that you have something to withdraw when needed. Can you start today in one small way to give yourself an act of loving kindness and compassion? It’s not your job to like me, it’s mine. Loving Yourself is Healing the World. Dr. Louise Lubin is a licensed clinical psychologist in private practice in Norfolk, Virginia since 1981. She is on the Community Faculty at the Eastern Virginia Medical School and practices adult psychotherapy and marital and family therapy. A major focus of her work over the last thirty years has been in Health Psychology with an emphasis on Cancer as a chronic illness. She has developed programs “Many Paths to Healing” for hospital systems and physician groups to provide patients with the tools necessary to cope and manage the emotional challenges of illness. These programs focus on harnessing the knowledge of the body, the power of the mind, and the wisdom of the spirit. Copyright Many Paths To Healing. All Rights Reserved. Website Design truenorthcollaborative.